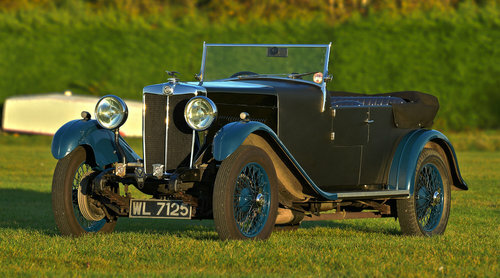 Vintage and Prestige are proud to offer this 1930 MG 18/80 MK I Speed Model For Sale. In the mid to late 1920s MG was still very much under the wing of parent company Morris and its owner William, but boss Cecil Kimber was keen to establish it as a completely separate company with unique products, as opposed to modified versions of more mundane Morris machines. 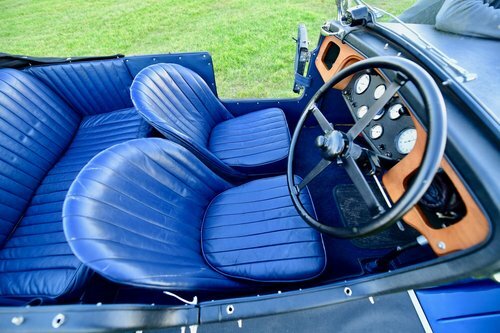 The 18/80 MG Six of 1928 was hence the first ‘genuine’ MG with its bespoke chassis and importantly trademark MG radiator surround. Kimber’s marketing chaps made plenty of this fact, stressing it was quite unlike anything on offer from Morris and the only place one could experience the new (almost) 2.5 litre straight six engine. 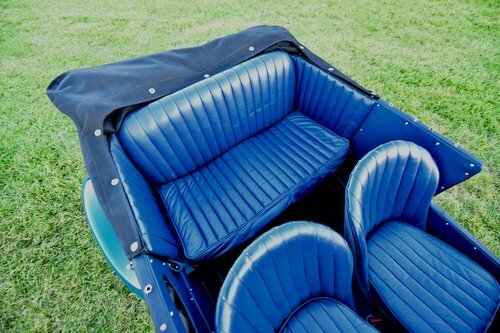 In a move that was the polar opposite of what some would describe as the cynical badge engineering foisted upon MG in the post Second War years, only the very best of materials were employed with huge attention to detail, some of which was invisible once the car was built. 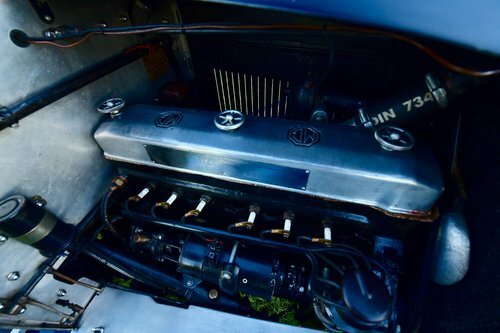 The 18/80 was fitted with the 2468cc six cylinder engine derived from the stillborn Morris Light Six unit. Substantially redesigned with a new block and twin horizontal SU carburettors tucked down below the exhaust manifold, its duplex chain driven overhead camshaft helped it to an impressive 60 bhp with bucket loads of torque to match. A cork clutch transferred the engine’s output to the rear axle via a three speed ‘crash’ gearbox and torque tube. 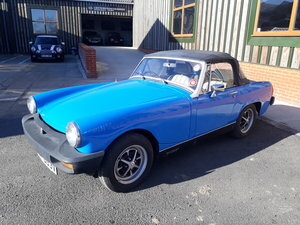 Bespoke MG front and rear axles were suspended via semi-elliptic springs damped by Mr Hartfod’s excellent friction units and while early examples utilised Perrot-style brakes, these were later replaced by cables assisted by a Clayton Dewandre Servo resulting in a highly effective system. The Marles frictionless steering gear came in for almost universal acclaim and the relatively large machine’s handling and road-holding was praised effusively. The end result was a very expensive vehicle (£695 in 1930) and though the headline grabbing MG Midgets won races and broke records left right and centre, the 18/80 was still a quick car. Only some five-hundred made in total, production ended early in 1931, stocks of new examples were still available well into 1934. 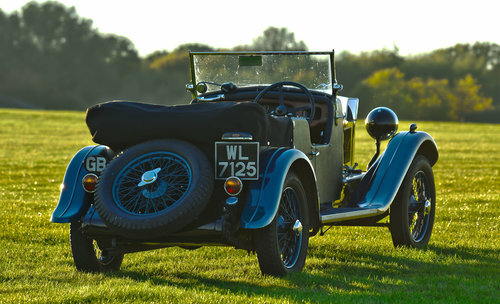 WL 7125 began life in 1930 wearing saloon coachwork, she was re-bodied in the 50’s to the open tourer style you see today. 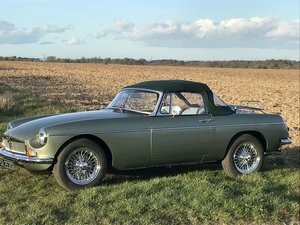 In 2001 under the ownership of John Hart (an aeronautical engineer) a full restoration was undertaken, stripped back down to the bare chassis, every inch was fettled to perfection thus resulting in a truly magnificent car. The Engine has covered a mere 17,000 since the restoration, amounting to 1k a year. She still runs beautifully and pulls a long with an impressive amount of torque. The body is finished in Black and Blue; Black to the wings and fabric body and Blue to the wings, wheels and interior. This is a striking and period correct colour combination that truly stands out in heavy sunshine. The current owner (a friend of Mr Hart) purchased the 18/80 in 2009 and has kept up the highly level of maintenance that was carried out under Mr Hart’s tenure.